I met Max and Brambles Mum and Dad, Charlotte and Jason at the Royal Bath and West Show. As I had a painting of a Cocker Spaniel on display they popped over to have a look and I'm so glad they did I just loved doing this one! 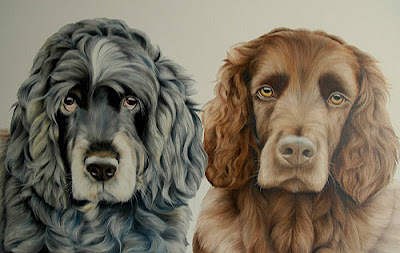 After sending through some photos of Max and Bramble we agreed on an X-Large size canvas as wanted to really be able to capture the detail and character in both of the dogs on one canvas. I just love working on a large scale and think it works well when painting two pets together. 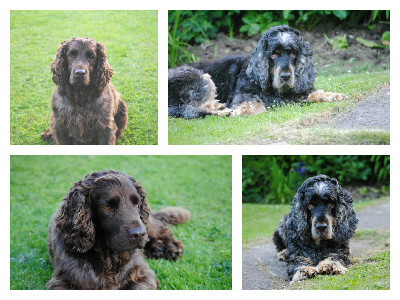 It was a bit of a time consuming painting, not only is there two dogs to paint but two very fluffy, curly eared Spaniels, but I'm not complaining and enjoyed every bit of it!